The EARTH study is a RCT that compared UrgoCleanAi?? and AquacelAi? ?, in the local management of venous Buy probalan or mixed leg ulcers predominantly of venous origin, at the debridement stage of the healing process. The results confirmed that UrgoCleanAi?? is similar in terms of efficacy (healing properties) to the control dressing AquacelAi? ?, after 6 weeks of treatment (surface area reduced respectively by 34.1% and 34.4%). Ai? 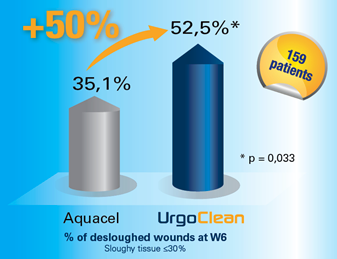 ?However, the autolytic debridement capacity of UrgoCleanAi?? is documented to be superior cialis china paypal. to that of AquacelAi?? (percentage of debrided wounds respectively 52.5% vs 35.1%). Overall, the investigating where can i buy fluconazole. physicians have considered the Global Performance Score of UrgoCleanAi? ?, which includes efficacy, safety and acceptability elements to be superior to that of AquacelAi?? (p=0.002). UrgoCleanAi? ?, expert in Buy trazodone online desloughing. * Meaume S, Dissemond D, Addala A, Vanscheidt W, StA?cker M, Goerge T, et al. Evaluation of two fibrous wound dressings for the management of leg ulcers: Results of a European randomised controlled trial (EARTH RCT). J Wound Care 2014;23 (3):105-116.